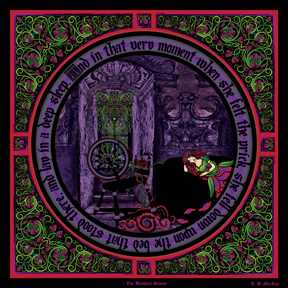 Description: The second panel of four depicting a Celtic version of Sleeping Beauty, also titled by the Brothers Grimm as Little Briar Rose. On her fifteenth birthday, the princess explores the castle and finds an old spinning wheel tucked away in a long forgotten room. Curious, she touches the needle and pricks her finger, enacting the angry faery's curse. She falls onto a nearby bed, her finger bleeding, her heart broken, her consciousness floating away into a deep sleep. Tainted with the darkness of the faery's magic, the roses in the window begin to change. A face forms, a skull reminiscent of a Medieval Day of the Dead. The vines creep along, covering the entire castle, approaching sweet Briar Rose as she lays there, unconscious and vulnerable.